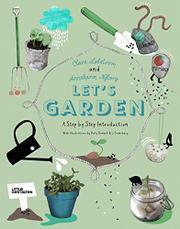 Stuffed with inventive gardening tips, plant-related crafts, and advice, the book is geared toward practical kids with inquisitive minds. Projects include making “Head Pots” (draw faces on the pots and plant seeds in them to make “hair”); planting sunflowers and harvesting the seeds to make bird food; planting beans and then making a tic-tac-toe game with them; and best of all, planting rabbit poops to find out what the rabbit ate! (But remember to wash your hands thoroughly afterward.) There are also recipes: garlic and cheese made from strained yogurt combined with garlic cloves that have sprouted in the fridge; potatoes, tomatoes, and edible flowers and fruit. Each activity or recipe is clearly described in a numbered sequence of kid-friendly, accurate drawings, followed by an attractive full-page photo showing the finished result. North American readers will need to know metric units of measure and accept that a few plants will be unfamiliar, such as the European stinging nettle.